Throwing a party is an incredibly stressful task. The food, drinks, invitations, etc. take quite a bit of time. While we can’t do those things for you; we can let you relax after the party and we will take the stress from there! There are people coming into your home (for which purposes we offer other cleaning services that can be performed before a party), lots of food and drinks being carried throughout your home putting all of your belongings at risk, and with lots of people come lots of shoes. If your party date becomes a rainy day, all those shoes will turn into many dirty shoe prints all over the house and some on the carpet. That’s where we come in to save house! Swooping in at the speed of light we take care of all the dirty shoe prints with our highly recommended carpet spot cleaning. Our employees will continue to save your home by cleaning and disinfecting all hard surfaces and handles in the party vicinity. This service will take care of any food/drink mess made during the party and protect you from any germs that may have been spread from any guest attending the party. Any dishes used for the party will be collected, washed, and put away for your convenience. Garbage is collected from the party vicinity and taken out for you rain or shine! 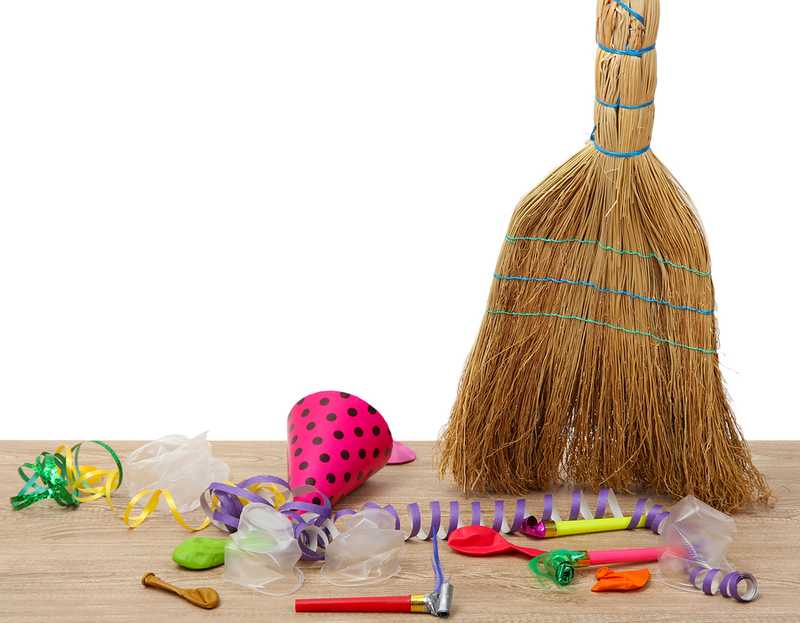 After we save your home from the messes of the party our employees straighten up you home and give it a quick (but thorough) vacuum to bring it back to its pre-party glory! If you are dissatisfied with our services in any way please don’t hesitate to call and let us know. After a few questions about the service and why you are dissatisfied we will do the service again while supervised. If something goes wrong we will gladly refund the money for the services with our sincerest apology. This service is one of our lighter cleaning offerings, and is not intended to be a true house cleaning, but instead just cleaning up of what the party caused. To avoid any issues with your satisfaction, our cleaning professionals will go through your home or apartment with your prior to cleaning in order to establish what will be done and what will not. After that time, changes in service may be made, however because of time scheduling constraints, it is unlikely that we would be able to switch over to a more intensive, time consuming true detailed cleaning. The following services will be performed only in all public rooms used for party. This does not include bedrooms, but does include bathrooms. * All items in visible area are disinfected and sanitized.